Select From One Of Our High End Style Options! Click this image to view the full page screen graphic of this style of campaign website. EASY TO USE! That’s right. You can update your own campaign website easily and generate all the reports you need without needing to hire expensive experts. We focus on the essentials so you can focus on the essentials of winning your campaign. 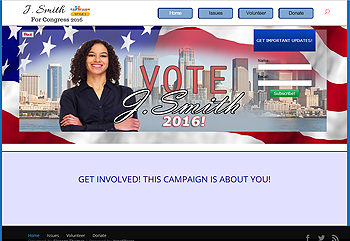 We have created these beautiful campaign websites based on years of experience with grassroots political campaigns and effective activism. ENGAGE SUPPORTERS! The websites are designed to help you engage supporters in volunteering and donating using social media tools so they can share your ideas, your speeches, your fundraising efforts and your events with all of their friends and family through the largest collection of Internet social media networks available! VOLUNTEER MANAGER! Each website comes with a completely custom developed CWS Volunteer software system to help you sign up volunteers and easily communicate with them to activate and mobilize them! DONATION READY! Each website comes with an integrated donation page that connects to your campaign’s Paypal account. Alternatively we can direct your campaign donations to a third party system of your choice! RESPONSIVE DESIGN! As many as half of all users of the web access it by a mobile phone. Our sites are optimized for display on phones, tablets and desktop computers. YOU OWN IT-NO MONTHLY FEES! YOU PURCHASE & OWN YOUR SITE! There are no monthly fees to use this software. You own your site and can upload any size voter file you wish. You are responsible for hosting your own site with any hosting service you wish. We can recommend a number of reliable affordable hosting solutions to you. We can assist you with managing and updating your website for a small monthly fee should you desire to engage us to do so. 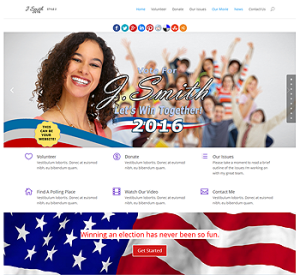 GETTING YOUR CAMPAIGN WEBSITE IS EASY! To keep your campaign costs down & deliver your website quickly we have three stylish options for you to choose. We are looking forward to starting your website. Just deposit 50% with us endorse the paperwork & we are good to go! On average you’ll take delivery of your new custom campaign website in 10 days or less! Did we mention this was easy to use? or blog it’s easy as pie. And we are always here to help! PRESENT YOUR ISSUES! This style allows you to fully express your stance on important campaign issues on your issues page using the “accordion” information navigation tool so people can easily click to read the issues they care the most about and get excited about working with you and donating to you. VOLUNTEER MANAGER! Each website comes with a completely custom developed CWS Volunteer software system to help you sign up volunteers and easily communicate with them to activate and mobilize them! This style of campaign includes a volunteer signup form that feeds into a back end admin where you can manage your volunteer sign ups including tracking your conversations with volunteers. VIDEO FRIENDLY! If you have campaign video of your events and or speeches you can display them embedded directly on the page so it’s easy for supporters and future constituents to access instantly! FEATURE YOUR ENDORSEMENTS! Use the tabs navigation tool to display your endorsements, your personal bio and story and your accomplishments so people can quickly and easily get to know you and feel at ease with you as a person that they want to represent them. Keep your contact form on the main page so it’s easy for people to reach out to you be they donors, volunteers or the media seeking interviews! EASY TO USE! That’s right. You can update your own site easily and generate all the reports you need without needing to hire expensive experts. We focus on the essentials so you can focus on the essentials of winning. We have created these sites based on years of experience with grassroots campaigns and activism. Let’s get started building your new pro-level responsive website today.